Friday night pizza is a tradition for Jennifer Leamons, executive chef at Stanly Regional Memorial Hospital in Albemarle, N.C. One evening, instead of starting with the usual flour-based dough, she decided to make something less bready “with more of the good stuff,” she says. So she blended ricotta cheese with cauliflower into a mixture that resembled lasagna filling. 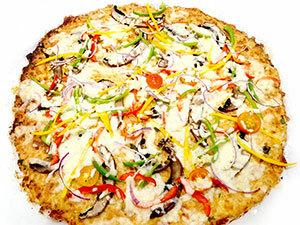 Baked with vegetable toppings, the pizza not only was lighter and more nutritious, it was gluten-free. The recipe has become a staple in the doctors’ lounge at Stanly, where several patrons request gluten-free choices. 1. To make the “crust,” Leamons pulses cooked, fresh cauliflower and ricotta cheese in a food processor until it has the consistency of rice. “Frozen, thawed cauliflower works too, as long as it is drained well to remove excess moisture,” she says. She then combines the cauliflower-ricotta mixture in a bowl with shredded mozzarella, chopped basil and parsley and beaten eggs. “The eggs are the ‘glue’ that holds the ingredients together,” says Leamons. 2. Leamons lines a baking sheet with parchment paper and pats out the cauliflower mixture into a 1/4-inch-thick circle. “It’s very important to flatten the mixture evenly, forming about a 12-inch circle,” she says. The cauliflower crust bakes at 325 F for 30 minutes. 3. Once the crust turns golden, it’s brushed with roasted garlic oil and topped with an assortment of fresh vegetables, which are lightly sauteed or roasted if desired. 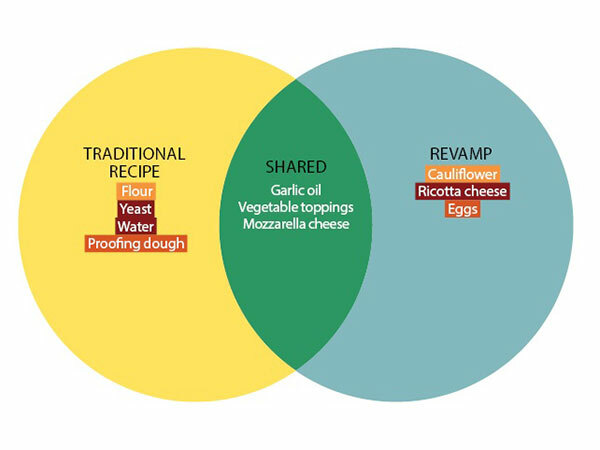 “I also sprinkle on a little more shredded mozzarella,” says Leamons, “then pop it back into the oven for 10 minutes to warm the veggies and melt the cheese.” She warns cooks not to overload the toppings because the nontraditional dough is a little less sturdy. Even so, it’s easy to cut with a standard pizza cutter as long as it cools for 5 minutes to set, she says. The pizza takes less than an hour from start to finish, versus two and a half hours for the prepping and rising required with traditional crust.